Those who pre-book the phone (regular price Bt10,990) will receive an exclusive discount of Bt6,500 and also get a Bt40 monthly discount for 10 months when applying for the OPPO Max Speed monthly package priced at Bt1,099 if they pay Bt4,000 in advance. The package will give them unlimited free data and 400 minutes of free calls to all networks. Buyers will also enjoy a full-range of entertainment in HD through TrueID free for 12 months, get an exclusive OPPO souvenir bag, a 1-year warranty for cracked screen worth Bt6,590 or the choice of a 0-per-cent instalment plan for up to 15 months. Customers can pre-book the phone from March 16 to 27 and pick up the unit from March 28 to April 8 at True shops, 7-Eleven outlets, OPPO outlets or participating retail shops. The “OPPO F11 Pro” comes with a dual rear camera with a whopping 48-megapixel primary sensor and a 5-megapixel secondary camera, making it perfect to shoot brilliant portrait shots in low-light conditions. Its innovation comes in the form of a pop-up selfie camera on top of the phone. It features a 6.5-inch FHD+ display, and is compatible with 3G/4G networks (users can connect two SIM cards to 4G network). It runs on ColorOS 6.0 and utilises a powerful 4000mAh battery with VOOC flash charge 3.0. The OPPO F11 Pro boasts a distinctive appearance and comes in different colour options including Thunder Black and Aurora Green. TrueMove H customers can be the first to purchase the OPPO F11 Pro. 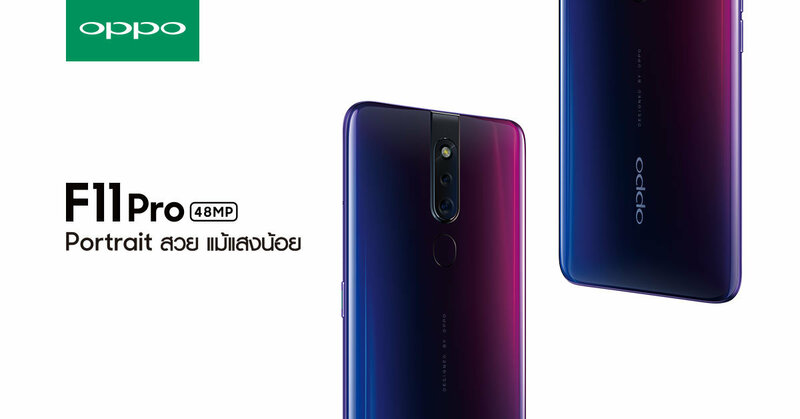 Visit www.truemoveh.com/OPPOF11Pro/pre-order or call 1242 for more information.